A Janata Dal-United (JD-U) delegation led by party MP R.C.P. Singh on Friday approached the Election Commission (EC) and staked claim over the party symbol, saying former party President Sharad Yadav has no basis to claim the party as his own. Last month Sharad Yadav had also submitted a memorandum to the commission, staking claim over the party. “Today (Friday) we met the EC and submitted all documentary proof related to party. We submitted the affidavits of 71 of our MLAs, 30 memebers of Legislative Council in Bihar, two Lok Sabha members and seven Rajya Sabha members, which they have given in support of Nitish Kumar,” party General Secretary Sanjay Jha told IANS. Besides, the delegation also submitted letters of support by the “majority of National Executive and National Council members and the party office-bearers” to the Election Commission, Jha said after the meeting. “We also contended before the three Election Commissioners that Sharad Yadav has no documentary support to stake claim to party. If he had any, he would have already submitted it,” he said. 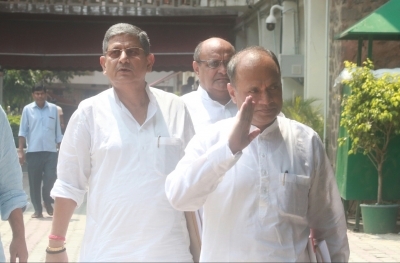 Jha said the delegation told the commission that Sharad Yadav was only trying to “buy time” as the JD-U had given a letter of request to the Rajya Sabha Chairman for his disqualification. “Sharad Yadav has reportedly told the Rajya Sabha Chairman that his matter is being heard at the EC, so the disqualification matter should be put on hold till the EC decides. He is simply trying to buy time,” he added. The JD-U also submitted that Sharad Yadav had voluntarily left the party and had indulged in anti-party activities. The delegation consisted of R.C.P. Singh, Sanjay Jha, Lallan Singh and K.C. Tyagi.